Even if you have 150 students, you can (and should) find out what they think. It is possible, with clickers and index cards, to ask the opinion of all students very often and therefore know whether what we are doing in class is working. So we’ll make sure to keep those! Almost three years ago, in early 2012, I attended a talk by Martin Nowak. He talked about cancer and one of the things he said was that treatment with multiple drugs at the same time is a good idea because it helps prevent the evolution of drug resistance. Specifically, he explained, when treatment is with multiple drugs, the pathogen (tumor cells in the case of cancer) needs to acquire multiple resistance mutations at the same time in order to escape drug pressure. As I listened to Martin Nowak’s talk, I was thinking of HIV, not cancer. At that time, I had already spent about two years working on drug resistance in HIV. Treatment of HIV is always with multiple drugs, for the same reason that Martin Nowak highlighted in his talk: it helps prevent the evolution of drug resistance. However, as I read the HIV drug resistance literature and analyzed sequence data from HIV patients, I found evidence that drug resistance mutations in HIV tend to accumulate one at a time. This is contrary to the generally accepted idea that the pathogen must acquire resistance mutations simultaneously. There seemed to be a clear mismatch between data and theory. Data show mutations are acquired one at a time, and theory says mutations must be acquired simultaneously. One of the two must be wrong, and it can’t be the data! So, we met. Logically, Alison Hill and Daniel Rosenbloom, then grad students in Martin’s group, were there too. I had already met with Alison and Daniel many times, since they were also working on drug resistance in HIV. John Wakeley (my advisor at Harvard) came to the meeting too. Between the five of us, we brainstormed and fairly quickly realized that one solution to the conundrum was to assume that a body’s patient consisted of different compartments and that each drug may not penetrate into each compartment. Maybe we found this solution quickly because Alison and Daniel had already been thinking of the issue of drug penetration in the context of another project. A body compartment that has only one drug instead of two or three would allow a pathogen that has acquired one drug resistance mutation to replicate. If a pathogen with just one mutation has a place to replicate, this makes it possible for the pathogen to acquire resistance mutations one at a time. We decided to start a collaboration to analyze a formal model to see whether our intuition was correct. Over the following three years, there were some personnel changes and several moves, graduations and new jobs. Stefany Moreno joined the project as a student from the European MEME Master’s program when she spent a semester in Martin’s group. When I moved to Stanford, Dmitri Petrov became involved in the project. Next, Alison and Daniel each got their PhD and started postdocs (Alison at Harvard, Daniel at Columbia), Stefany got her MSc and started a PhD in Groningen, I had a baby and became an assistant professor at SFSU. No one would have been surprised if the project would never have been finished! But we stuck with it and after many hours of work, especially by the first authors Alison and Stefany, and uncountable Google Hangout meetings, we can now confidently say that our initial intuition from that meeting in 2012 was correct. Compartments with imperfect drug penetration indeed allow pathogens to acquire drug resistance one mutation at a time. And, importantly, the evolution of multi-drug resistance can happen fast if mutations can be acquired one at a time, much faster than when simultaneous mutations are needed. Our manuscript can be found on the BioRxiv (link). It is entitled “Imperfect drug penetration leads to spatial monotherapy and rapid evolution of multi-drug resistance.” We hope you find it useful! Of course, it could be my interpretation of the data! 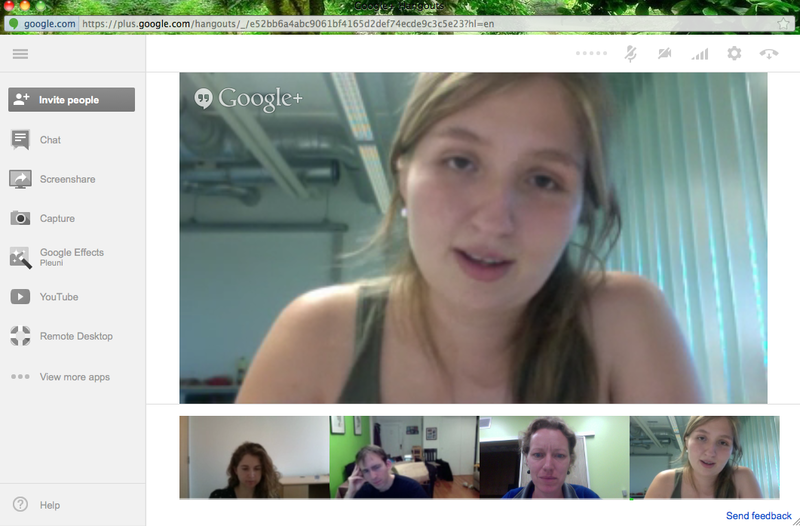 Stefany Moreno (in large window), Alison Hill, Daniel Rosenbloom and myself in one of the many Google Hangout meetings we had.